Last week, I received my Printrbot Plus v2.1 Kit. I sat down, and started putting it together. The Assembly page on the kit website describes the kit as taking 6-10 hours to assemble. In the end, I spent about that getting the thing to the point where it was put together; it wasn’t all in one sitting, since I found out I was missing a part about 75% of the way through. You can see a time lapse of the initial assembly on YouTube. Lay out your parts and count them before you start. Organize them, and put them in a spot where they are out of the way of your work area, but easily accessible. You’ll save a lot of time that way, and a lot of headache when you later find out you’re missing parts you need. For something like this — which required more than 100 screws — a good electric drill is a good idea. I had one, but didn’t think to use it until after my initial work; I wasted a lot of time on that. The Printbot process is targeted at tinkerers. This means that there are some aspects which are… slightly more fiddly than they should be. (One of my parts didn’t fit right to start with, and I spent the first 20 minutes of my assembly process trying to fit a part into a hole that it simply couldn’t fit in.) Don’t fight it too hard; if something doesn’t work, move on and come back. In the end, I had to buy myself a ACME threaded hex nut myself to finish the build; I got an extra 5/16″ (non-ACME) hex nut instead of the 3/8″ ACME nut I needed shipped with the bot. (I emailed Printrbot support last Sunday about this — I’ve still heard nothing about this.) I used that to finish the assembly. Initially, I was worried about my filament feeding; you can see a video showing how it doesn’t feed straight down, but feedback on the Printrbot Talk forum suggested this is normal, and I took the next steps of doing a print the following morning. The reason though was immediately obvious: early on in my print process, I couldn’t find a set screw on my y axis motor. 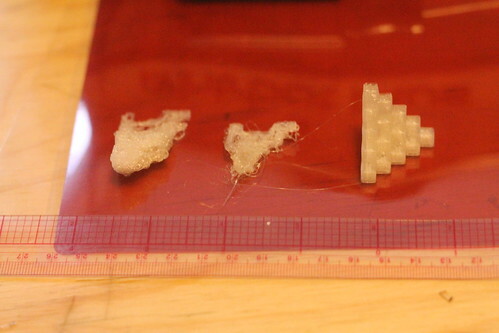 Each layer that printed, my y-axis was slipping about 2-3mm in the wrong direction, which lead to the disaster that you can see. On Friday night, I fixed that, and the next print was actually stacking the layers, which is good; but my bed being far from level meant that the print head was running into itself on higher layers, and created a mess. In total, I spent about 10 hours building the thing, another couple hours getting it set up and working. I consider the project a success overall. After ordering on Dec 13th, and the package being dropped off at the UPS Store in California on Dec 31st, my 3d printer is finally in Somerville, MA, with the expected delivery later today. While I’m not going to claim it will actually be here today — I mean, after all, it was supposed to be here yesterday as well — I am slightly hopeful, since the UPS website at least claims it is in this state. … Crap. This means that I will soon have to follow the 122 step assembly process soon. On the plus side, only a half dozen or so of the steps have comments attached to them describing them as impossible with the materials provided, so that should be good! When purchasing, I had an option of buying an assembled kit for $100 more. Given the 6-8 hour timeline for doing the build, this would almost certainly have been a financially wise course of action; however, as I told a coworker: If I can’t even sit down and spend 6 hours building the thing, when am I ever going to make time to fiddle with *actually printing something*? Along with the new TV, I also set up an AppleTV — a small set-top box designed to hook up to the Internet and provide some content. Or something. I say this because I really don’t understand what AppleTV is supposed to be doing for me; it’s a walled garden of apps, with no ability to extend it — no app store, or anything like it — and I can’t understand a lot of what it is useful for. I suppose part of this is because I’ve never bought into the iTunes way of life — I don’t buy videos or music on iTunes, and I don’t even know the password for my MyAppleCloudWhatever account, so in some ways, I’m probably not an ideal candidate for the Apple way of life that the Apple TV is trying to tie into. However, the Apple TV has proven useful for one thing that I didn’t know anything about when I set it up: AirPlay. Apple’s AirPlay started out as AirTunes, for streaming music content, and grew into a more general media (and screen) sharing technology later on. I’ve seen options for AirPlay in OS X for a number of years, but I didn’t really know much about it, so I just ignored it. I set up the AppleTV, but wasn’t really using it — I had watched some TV while plugged into an HDMI cable directly from my Macbook Pro, but not poked at the AppleTV at all. Then, I turned on the TV… and Kristan’s computer screen was mirrored on the TV. (Apparently some apps when they go into fullscreen mode will automatically activate AirPlay in some way — specifically, the Cake Mania Main Street game appears to do this.) Prior to that, I didn’t really have any idea what AirPlay was — but suddenly, I found out that I could put whatever was on my screen on the TV with one button click. To me, this is actually one of those times when technology actually (mostly) works: I’m watching something on my computer, and someone else in the room says “That sounds interesting, you should put it up on the TV”… and they click one button, and it goes on the TV. Of course, it’s still software, so it’s not without it’s flaws. I actually found that the Linksys WRT54G router that I had wasn’t keeping up with the demands of running AirPlay over the wireless; even plugging the AppleTV into the ethernet was still not up to snuff, so I unboxed the Apple Airport Extreme we’ve also had lying around; switching to that cleared the issues up. (Looking at the CPU usage on the router, I think this is actually just that the chip can’t keep up with the demands of the network traffic — it was maxing out the CPU moving data around — rather than any specific software problem. Of course, the AppleTV has other functionality — the ‘apps’ that exist on it. So far, I’ve used both the Netflix and YouTube apps on it, and neither leaves me super impressed. (Admittedly, I apparently used the ‘default’ software that came with the device; I received a Software Update a couple days later which installed about 10x as many apps, and probably changed the functionality of the apps I did have, so some of this criticism may be out of date.) The Netflix app lacked auto-play (a key feature for me, since I spend most of my time watching many episodes of television shows), and even navigating to the next episode via button presses proved more annoying than it should have been. The YouTube app appeared to completely lack the ability to downgrade the streaming quality — it would play at whatever the highest quality level was — which just flat out didn’t function on my DSL connection, which could usually support a 720p stream, but even that wasn’t reliable. This meant that all the time on YouTube was spent buffering videos and no time actually watching them. If the AppleTV actually supported DIAL — a spec for remote device discovery and application launching — I could imagine using it a bit more. If I could just launch the Netflix player on the Apple TV by clicking a button on my laptop, I could certainly imagine using it more, and the same with the YouTube app. AirPlay makes things easy, but it means that I’m tied to not using my computer while using AirPlay; it would be worth it to me to use the less fully featured app if I could start it more easily. (Searching via an on-screen keyboard with a 6 button remote is not particularly user-friendly.) In fact, I’m considering setting up my long-avoided Google TV (Logitech Revue) to see if it will function in this way — or possibly even going the next step and buying a Chromecast solely for this functionality. Of course, Apple and standards have never been a great friend, so I’m not surprised here, just annoyed. To me, so far, the Apple TV doesn’t provide a lot of functionality for me. With a little bit of software support, I think it could be a much more useful device — DIAL support would be a killer app for meI don’t ever expect to use anything other than YouTube and Netflix as far as apps — the others require subscriptions I don’t have in order to be useful, or just aren’t that interesting. Without an iTunes account, I don’t see any major benefits from any shared media purchasing. However, as an AirPlay receiver for quickly sharing what’s on my screen, I think it’s a useful device to keep around, and I expect I will continue to let it have a home in my living room entertainment going forward for that reason alone. Over Christmas, I bought myself a 3D printer kit from printrbot. It didn’t arrive in time to occupy me over the holiday break, however, which meant that over the weekends, I was actually lacking in toys to play with for myself. Since I had already spent somewhat lavishly on myself — I bought the Printrbot Plus kit, which is pricier than I really should have — I was looking for a toy that would be entertaining but also relatively inexpensive. In the end, I went with the Raspberry Pi Model B: A credit card sized ARM-based computer. Part of the reason was actually related to my 3D Printer: Since prints take a long time to run, having the Pi as an extra computer I can hook up to the printer when needed seemed opportune — but part of it was just the fact that it was relatively inexpensive and seemed like it might let me do some interesting things. Originally, I had planned on using it as a video game emulator — something that a number of people have talked about having done, via distributions like RetroPie and the like. Unfortunately, I’ve had some trouble getting the primary platform I’m interested in emulating — NES — to run at a reasonable speed. (Amusingly, SNES emulators seem to actually be noticeably faster.) This has led to some interesting research and reading about emulators — like an article in Ars Technica about how accurate emulation requires much more resources than the original hardware, and how emulator developers should take advantage of the hardware they have available these days. In the end, I haven’t really done that much of interest with the Pi yet — nothing I couldn’t have done using the Linux machine that I already pay for on Linode. However, it has led to me actually doing some things that I hadn’t otherwise — setting up Asterisk, for example. It’s now possible to dial a given phone number, and you’ll be logged into a conference call served from my Raspberry Pi. I also set up munin — after having serious issues with Verizon for months, I was finally able to track and confirm that I was getting packet loss to Google at regular intervals. None of this is particularly complex, but there’s also nothing pi specific about it — these are things you can do pretty easily with *any* linux computer — but I haven’t had another computer running in this house for years, and the Pi provided motivation to learn these things. In short: Raspberry Pi. Cheap, Small Linux computer. For me, not a lot more or a lot less — but having a Linux computer in the house is a nice thing to have. It’s also got me interested in a few new areas of interest — emulation, home automation, and amateur electronics — which may prove more interesting than the computer itself. Over the Christmas break, I invited a new friend into my home electronics: a 32″, 1080p television set. Now, most people would say “What? You’ve migrated most of your media consumption to your laptop anyway, why would you go back to having a functioning television?” And that’s a completely reasonable question. The primary reason is: for fun. This has resulted in me putting together a lot of little things that we’ve had floating around the house for a while, but never actually used — an Apple TV my wife bought back when we were watching TV more often (but which only supported HDMI, which our old TV didn’t have); a new Airport Extreme wireless base station — and buying some new, relatively inexpensive things as well — a broadcast television antenna, for example — and even a shift in my home internet provider. I’m going to be trying to write a bit more about each of these things individually — why I ended up with them — but I wanted to start with the basics: The only reason I did any of this at all was basically because the only monitor I had for the $35, credit card sized computer that I had in the house was a $500 Phillips HD TV. You are currently browsing the Technical Ramblings weblog archives for January, 2014.